Indeed it does. Back in 1956, Bob Rosburg, the 1959 USPGA Champion and a six-time tour winner, opted for a 4-iron into a strong headwind. The wind vanished when he was already beyond the point of total commitment, and his ball landed on the 9th green of the adjacent Augusta Country Club miles through the green. Moments later he used the same club to knock it on the green for a simple two-putt double. Sam Snead referred to it as a whirlpool effect. For Ben Hogan, the answer was to wait until he could feel the wind on his left cheek before hitting, and many advocate biding their time a little on this tee while they gather their thoughts and attempt to weigh up the often confusing evidence before their eyes. Bernhard Langer, perhaps surprisingly, has pointed out that you can’t wait forever, and that sometimes waiting too long only leads to greater bewilderment. If in doubt, overclub as the up-and-down from the back fringe is fairly straightforward. Maybe, but the splash shot from the rear bunkers back towards Rae’s Creek can be a truly daunting prospect from all but the perfect lie. For Hale Irwin it’s the trees flanking the 13th that hold all the clues, while Tom Kite and recent two-time champion, Bubba Watson, base their decision on the prevailing wind if the immediate evidence is conflicting. Mind you, it may be best to take the defending champion’s word with a pinch of salt, for despite winning twice, he is a cumulative eight-over par on the 12th in 24 competitive attempts to date, although admittedly seven of those dropped shots are down to the 10 he made here in the final round in 2013. Analyse that 10 in depth, though, and it pretty much sums up the challenge of Golden Bell: tee-shot into Rae’s Creek; third shot from the fairway into Rae’s Creek; fifth shot from the fairway into the back bunker; sixth shot from the bunker back into Rae’s Creek; eighth shot from the back bunker played out almost sideways to avoid a potential repeat; ninth shot chipped 15 feet past the hole; 15-footer holed for 10. 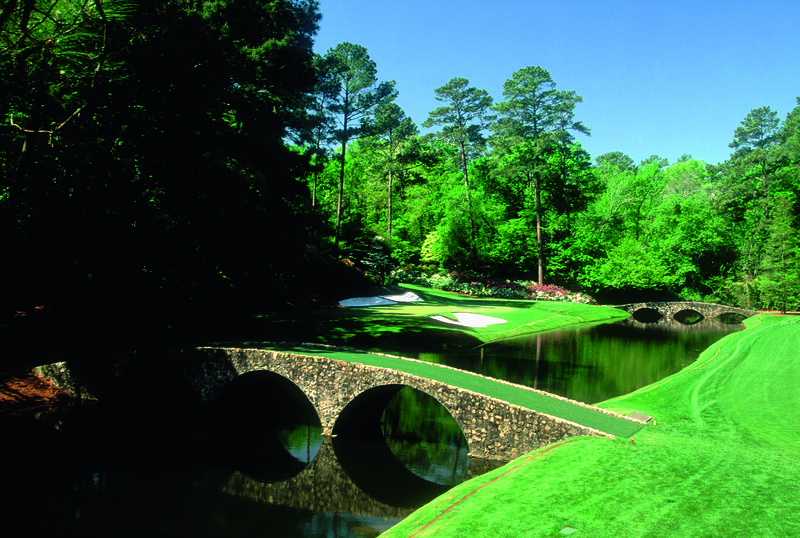 In these times of ever-increasing course length, where 230-yard par 3s come pretty much as standard, this 155-yard stretch of often unfathomable golf should be a cause for continued celebration… though not, of course, for anyone standing on the tee here on Sunday afternoon with a Green Jacket tantalisingly within reach.